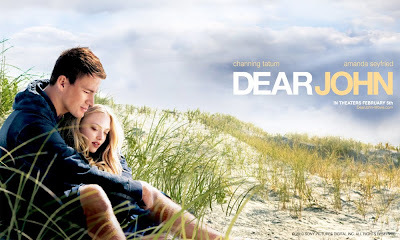 I was looking forward to seeing this movie because I had read the 2006 Nicholas Sparks book on which it is based. The film ended up surprising me in a good way in some cases, but mostly in how they changed so much from the Sparks novel on which it was based. It's the summer of 2001, and John (Channing Tatum, "She's the Man") is home in South Carolina for a two-week leave from the Army Special Forces. There he meets Savannah (Amanda Seyfried, "Mean Girls"), who is spending her spring break in South Carolina. The two fall in love but soon John has to go back overseas to Germany, and Savannah must return to school. He promises her that they will be together in 12 months when John gets out. But after the Sept. 11 attacks, John's entire unit re-enlists—and he does as well. The two write back and forth but eventually Savannah will write the dreaded "Dear John" letter, saying that she is breaking up with him. I would say Maybe see this movie. The story spans over several years and the ending has a bit of a twist to it. However, many details were changed from the novel. Tatum plays a likeable John, though his acting is not that great (we all know he's there to be eye candy, anyway). Seyfried actually plays Amanda really well; in one scene, she sings and plays guitar, and has a fairly good voice. The movie lags in places and seemed a lot longer than its 108 minute runtime—I was checking my watch frequently during the movie, which is never a good sign and usually means the movie is boring me. Fans of the book might or might not like the movie—most of the plot mirrors the book, but the plot details that WERE changed are major changes. I was also surprised that the movie was focused so much on war and John's role in the army, as the trailer suggests it's more about the love story between John and Savannah. This is a tie-breaker movie: see it if you're undecided on what film to see, but if you have other choices, I would go with one of those instead.